Today is the first Sunday of Advent, the first Sunday in the ecclesiastical year in many churches in the West, and the beginning of Christmastide in general. I like to follow the church traditions for Christmas and Easter, rather than succumb to secular chaos. I have discussed my general idea about “unpacking” Christmas in many places – e.g. here http://www.passionintellectpersistence.com/unpacking-christmas/ I’ll give a quick synopsis now, and you can see how it works if you follow this blog to Christmas Day and beyond. The simple way to think about the whole business is that Advent is not Christmas. Advent leads to Christmas in the same way that Lent leads to Easter. It is a time of preparation and anticipation. If you just plunge right into the whole pageant full bore, listening to carols or Christmas music blaring in stores, seeing images of Santa, angels, wise men, baby Jesus etc. etc. all jumbled together, having festive office and home parties, present shopping amidst frantic crowds, and all the rest of it, you are missing the whole contour of the season, and I am not surprised if you are exhausted by the time the 25th of December rolls around, and are glad when it’s over. If you take slow steps towards Christmas and prepare properly, the season unfolds slowly and joyously. You can savor each moment for what it is, and not try to cram it in all at once. No one knows for sure when Advent was inaugurated as a church season. The earliest source asserting December 25th as the date of the birth of Jesus was Hippolytus of Rome (170–236), writing very early in the 3rd century, and basing the date on the assumption that the conception of Jesus took place at the Spring equinox which he placed on March 25, and then added nine months. There is historical evidence that by the middle of the 4th century the Christian churches of the East celebrated the birth and baptism of Jesus on the same day, on January 6th while those in the West celebrated a Nativity feast on December 25th, and that by the last quarter of the 4th century, the calendars of both churches included both feasts. Advent was added some time in the 5th century, it appears. There was some kind of preparatory season before Christmas as early as 480 but it was the Council of Tours of 567 that firmly fixed the idea by ordering monks to fast every day in the month of December until Christmas. Advent and Christmas were not, and still are not, as important in the Christian church as Easter, but you’d never know this given the secular hijacking of Christmas for commercial purposes. In fact, until the 19th century Christmas was a rather low-key affair, and it was Dickens more than anyone else who was responsible for raising its profile in the public eye. I’ll let the secular world do its thing whilst I continue to follow old church tradition. For me, the Advent wreath is a tangible way to keep things in perspective. The concept of the Advent wreath originated among German Lutherans in the 16th century, but the modern Advent wreath took shape in the 19th. Johann Hinrich Wichern (1808–1881), a Protestant pastor in Germany and a pioneer in urban mission work among the poor is credited as the inventor of the modern Advent wreath. Supposedly, during Advent, children at the mission school Rauhes Haus, founded by Wichern in Hamburg, would ask daily if Christmas had arrived. In 1839, he built a large wooden ring (made out of an old cartwheel) with 24 small red and 4 large white candles. 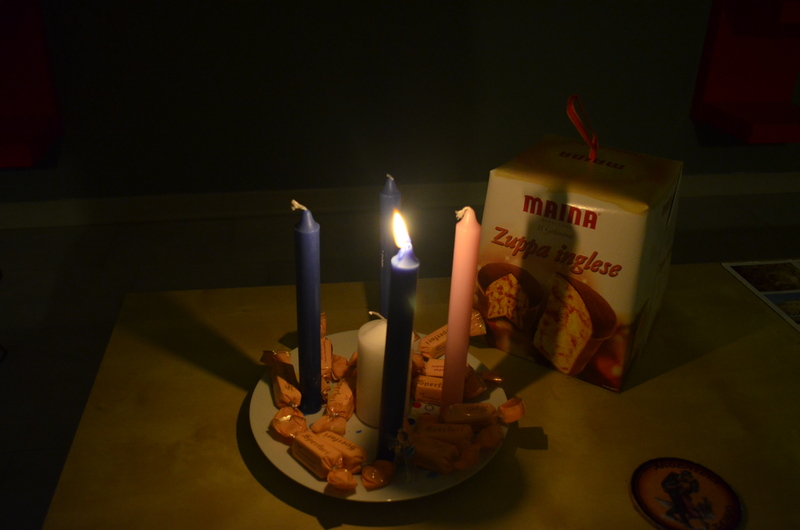 A small candle was lit successively every weekday and Saturday during Advent. On Sundays, a large white candle was lit. 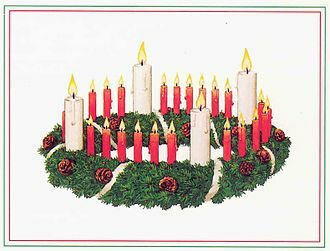 The custom gained ground among Protestant churches in Germany and evolved into the smaller wreath with four or five candles known today. Roman Catholics in Germany began to adopt the custom in the 1920s, and in the 1930s it spread to North America. The Advent wreath (or crown) nowadays can take many forms. Mine has four colored candles in a ring representing the 4 Sundays of Advent, and a white candle in the middle representing Christ. You start on the first Sunday of Advent by lighting one candle, then each successive Sunday you light one more until the whole circle is lit. Then on Christmas Eve you light all four plus the white candle, and do so again on Christmas Day. In this way you have the physical feeling of the season growing in intensity, Sunday by Sunday, instead of feeling as if everything has crashed down on you all at once. 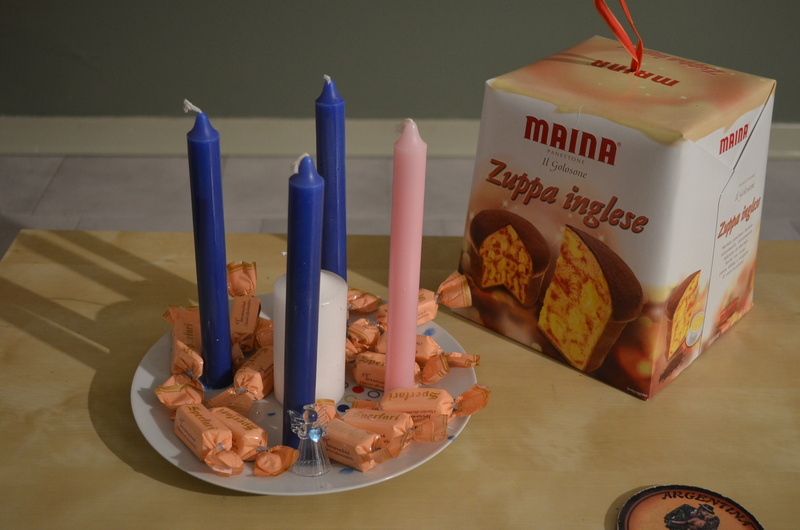 I make my Advent crown by taking a plate, affixing the candles to it by melting wax to form their base (and making a mess in the process), then adding assorted bits and pieces – mostly sweets – as decoration. At the start it’s very simple, but it grows as the season progresses. The crown is not a static decoration, but an ever-evolving one. The colors of the candles vary in different church traditions. In Protestant churches three are usually purple or violet symbolizing penitence, and one is rose (or pink). Sometimes people (especially in the Anglican and Methodist communions) use blue rather than violet. I’m not very fussy about such things; I tend to go with what I can find. The important point is to have one that is rose or red. In the current Catholic tradition, all the candles are red, representing the dominant Christmas color. It is a matter of choice whether you have a white Christ candle in the middle or not. In different traditions the candles have different names and meanings. When I was a pastor I used the sequence of Hope, Love, Peace, and Joy, with the rose candle signifying Peace. I’ll explore their separate meanings for me over the next three Sundays. For now let’s talk about HOPE. This is an easy one. 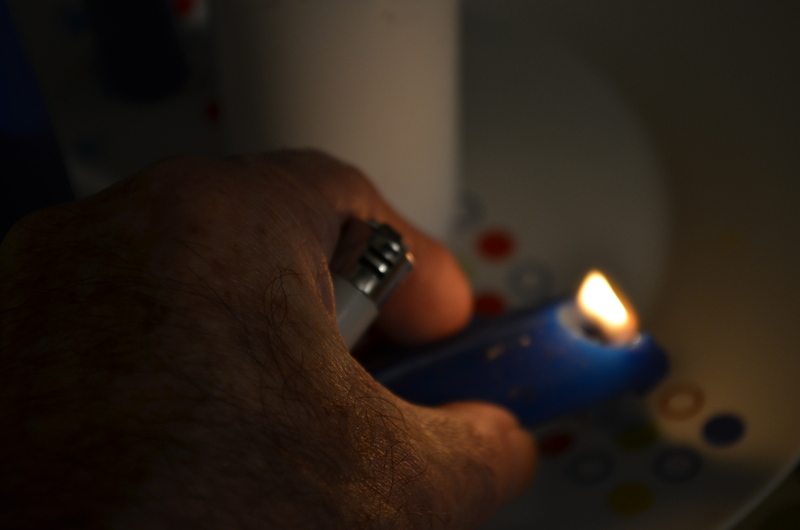 I always light the first candle in the crown very early – in the darkness – on Sunday morning. I want the mental and physical image to be one of starkness and bareness with a single, frail light dispelling the gloom of night. That image, to me, symbolizes hope very clearly. It gets slung into the general Christmas mix on CDs and such under the general rubric “Christmas music,” but deserves to be first, on its own, at the very beginning of Advent, then set aside. Food preparation is a most important aspect of Advent for me. I already shared here my making of Christmas puddings last Sunday http://www.bookofdaystales.com/stir-up-sunday/ because that little nugget precedes Advent. But the bulk of Christmas food preparation takes place within Advent. There are a number of things that need time to mature. Mincemeat is one. Pyes of mutton or beif must be fyne mynced & seasoned with pepper and salte and a lytel saffron to colour it / suet or marrow a good quantitie / a lytell vynegre / pruynes / great reasons / and dates / take the fattest of the broath of powdred beefe. And if you will have paest royall / take butter and yolkes of egges & so to temper the floure to make the paest. INGREDIENTS.—2 lbs. of raisins, 3 lbs. of currants, 1-1/2 lb. of lean beef, 3 lbs. of beef suet, 2 lbs. of moist sugar, 2 oz. of citron, 2 oz. of candied lemon-peel, 2 oz. of candied orange-peel, 1 small nutmeg, 1 pottle of apples, the rind of 2 lemons, the juice of 1, 1/2 pint of brandy. Average cost for this quantity, 8s. Seasonable.—Make this about the beginning of December. INGREDIENTS.—3 large lemons, 3 large apples, 1 lb. of stoned raisins, 1 lb. of currants, 1 lb. of suet, 2 lbs. of moist sugar, 1 oz. of sliced candied citron, 1 oz. of sliced candied orange-peel, and the same quantity of lemon-peel, 1 teacupful of brandy, 2 tablespoonfuls of orange marmalade. Mode.—Grate the rinds of the lemons; squeeze out the juice, strain it, and boil the remainder of the lemons until tender enough to pulp or chop very finely. Then add to this pulp the apples, which should be baked, and their skins and cores removed; put in the remaining ingredients one by one, and, as they are added, mix everything very thoroughly together. 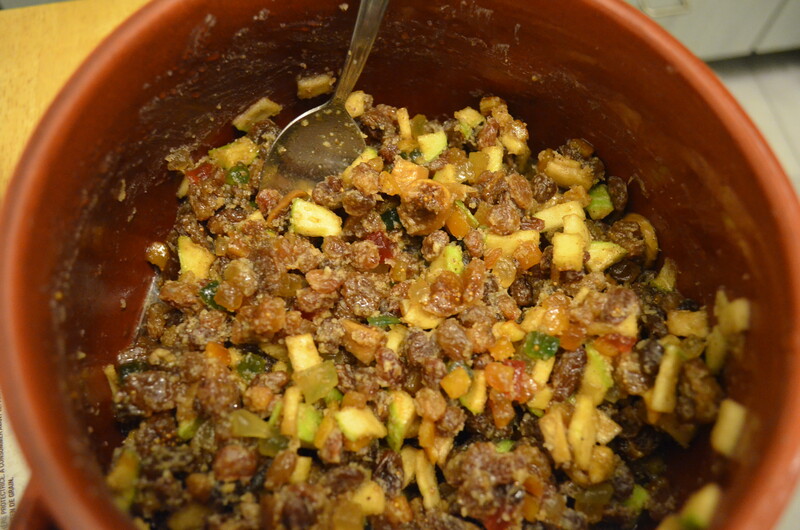 Put the mincemeat into a stone jar with a closely-fitting lid, and in a fortnight it will be ready for use. Seasonable.—This should be made the first or second week in December. Given her penchant for plagiarism, I doubt Mrs Beeton tested either recipe, but she got them from someone who did. For me, making mincemeat is a fairly simple, haphazard affair. 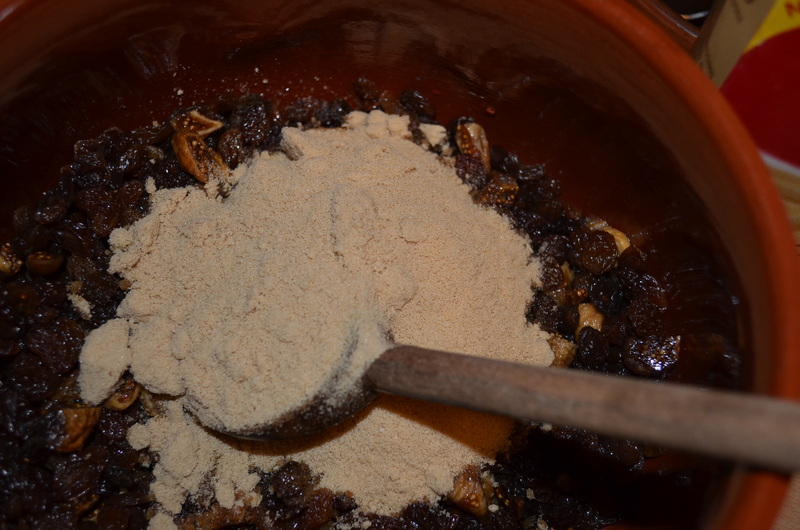 I start with a mix of raisins, sultanas, and currants, and add about half again of grated suet. Then I add some apple chopped fine and finish the fruit mix with what crystallized fruits and candied peel I have on hand. Finally, I moisten the mix with lemon juice and brandy, stir in a fair amount of allspice, cloves, nutmeg, and cinnamon to taste, and bottle it up until Christmas, leaving it to mature in the back of a kitchen cupboard. If need be I add brandy on Sundays when I “feed” my puddings. 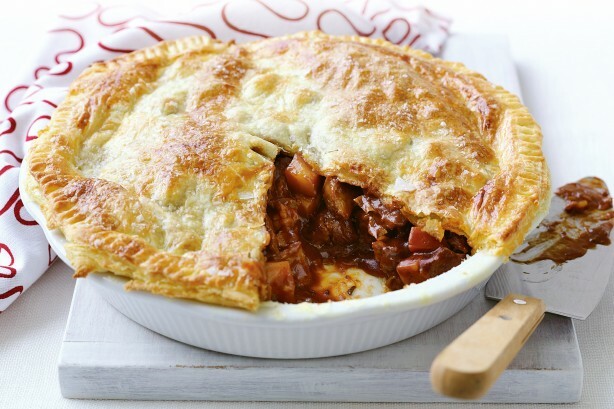 It’s ready to use in pies by Christmas Eve.